Ashe County ARES was advised on Thursday, September 13th by Ashe County Emergency Management to be on standby to deploy and provide emergency communications as needed as Tropical Depression Florence moved into the area. Emergency Management declared that 24/7 coverage would be needed at the Ashe EOC and at the shelter that was being put together at Ashe County High School by the Ashe County Department of Social Services beginning Sunday, September 16th. 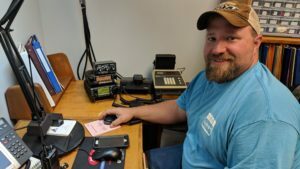 Steve Adams, NC4SA, Emergency Coordinator for Ashe County ARES organized the group of amateurs all from the Ashe County Amateur Radio Club and scheduled operators to be deployed to these two locations. Emergency Management decided to deploy 24 hours early due the the changing forecast track of Tropical Depression Florence. A briefing was held at 1:00 p.m. Saturday at the EOC by Emergency Management Director Patty Gambill and operators from Ashe County ARES deployed to the EOC and the shelter at Ashe County High School. The radio gear (HF/VHF/UHF) at the EOC and at the high school shelter was provided by a grant though Homeland Security in the early 2000s. Amateurs used the local W4YSB,147.300, club repeater, W4MLN’s 444.300 and W4MLN’s 443.7375 DMR repeater. None of these repeater systems lost power during the event. HF was also deployed at the EOC and at the Ashe Medics EMS Base. 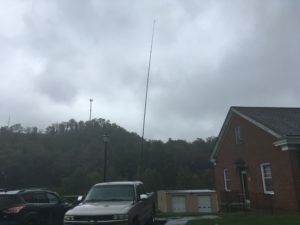 The Creston and Todd Volunteer Fire Departments, in the outlying areas of Ashe County, deployed amateurs to operate the VHF/UHF rigs there. 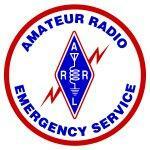 Communications links were established across the county on all repeaters and on HF. One piece of health and welfare traffic was passed during the event to the EOC via amateur radio to have a tree removed that had blocked a private drive. Other amateurs were monitoring on frequency and went to the aid of the fellow amateur with chainsaws in hand.. ARES operators changed in and out at the EOC and at the shelter throughout Sunday and early Monday morning. Emergency Management concluded the event on Monday, September 17th at 9:00 a.m. at which time Ashe County ARES was deactivated. Emergency Management expressed a deep gratitude for the generous support of Ashe County ARES during the event. Click here for the full story from the Ashe County Line. This entry was posted in Uncategorized on September 15, 2018 by Marty Norris.